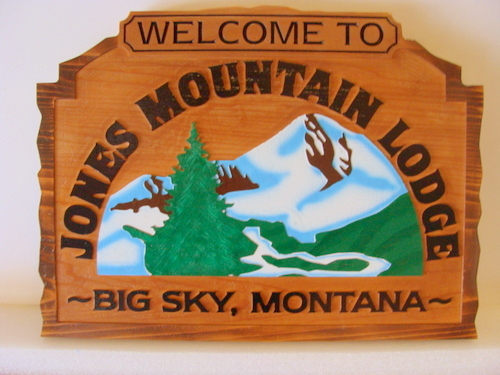 M22210 - Carved Western Red Cedar Sign for "Jones Mountain Lodge"
This interesting carved Western Red Cedar "Jones Mountain Lodge" sign has been carved in 2.5-D relief. The text and mountain image. complete with ski runs, is carved into the wood. After hand-painting, the sign is clear-coated twice for additional UV and weather protection.This large sign can be placed on an entrance gate, between iron or wood posts, or on a wall.